If you live in an area that has frequent tornados (like Oklahoma), you will definitely want to get a storm shelter. Once you have your tornado shelter, you will need to know how to use the shelter as effectively as possible in order to be safe from storms. First things first. Make sure that your family knows exactly what to once a tornado hits. Every single member of your family needs to know where the shelter is, where to meet, and what to grab. Don't just assume that your kids will know what to do! The key is to make a plan. Practice your family preparedness plan a few times with your family. Act like there is a tornado and have everyone follow the plan. This will not only teach your kids what to do, but it will also point out the obvious flaws with your plans that can be fixed later. 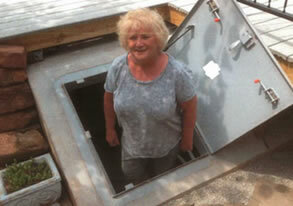 We have previously written a detailed article about what to keep in your storm shelter. As a recap, you should keep basic disaster supplies in your shelter. These things include: a weather radio, flash lights, water, food, blankets, and any other items that are unique to your family. You should also try to have some form of entertainment. Sometimes, storms can last a number of hours. Children in a small space with nothing to do can become frustrated and fussy. Simple things like cards, video games, board games, coloring books, or a DVD player will provide some entertainment. Once everyone is safe in the storm shelter, make sure the door is securely fastened and get ready to hunker down! If you have an outdoor concrete shelter, make sure to allow plenty of time to get to the shelter before the tornado arrives. If you wait until the storm is upon you, you will be exposed to wind, hail, rain, lightning and maybe even flying debris as you try to get to your shelter. Once the tornado is there, be prepared. It will be extremely noisy (some say it sounds like a freight train). The pressure may surprise you and your children. Your ears will definitely pop several times within seconds. Once the tornado passes there will be a seemingly dead calm. Once you are sure the storm has passed, it is okay to emerge from the shelter. After the tornado is over, you might seem overwhelmed with the next steps to take, especially if your home is damaged. Don’t worry! Check out our detailed article series, How to Recover from Disaster.